A FURTHER 26 local people have successfully completed the community development Activate courses supported by ng homes and delivered by the University of Glasgow. The main aim of Activate is to give local people who are active in their communities an opportunity to reflect on what they do and why they do it, in order for them to be more effective in working for the communities where they live and work. Those who participated and completed the course include ng homes’ tenants, people from the Asylum Seeker Refugee programme, ng homes Board members and staff and members of community and public organisations including Scottish Fire and Rescue Services. Activate strengthens local networks and people attending get a chance to listen to each other and see different ways of working together. In particular, having a group where there is a mixture of ages, ethnic backgrounds and work or voluntary experiences enables participants to think more deeply about the work they are doing and challenge their own views and the views of others. The areas covered by the course include the values and principles of community development, anti-discriminatory practice, power and participation, local and global links, group work, learning for change, monitoring and evaluation. Over the period of time that ng homes has partnered with the delivery of Activate it has brought together volunteers and staff from a number of local community organisations.These include Phoenix Futures, Red Road Family Centre, Young Peoples Futures, Children Inclusion Partnership, North Glasgow Food Initiative, Depot Arts, Concrete Garden, Faith in Throughcare, Bridges project, Police Scotland, Scottish Fire and Rescue Services, ng homes and ng2. 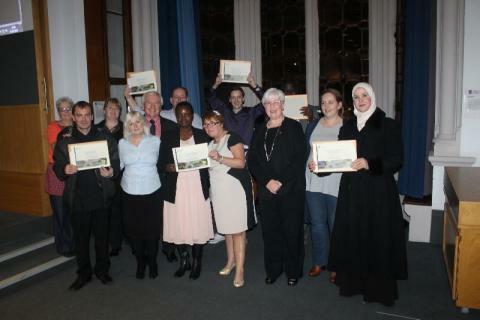 Certificates were presented by ng homes Board Member Cllr Allan Stewart and MSP for Maryhill and Springburn Patricia Ferguson who recognised the impact the Activate course has had on participants with a Scottish Parliamentary Motion. Amongst those who completed the latest course were Chairperson of Social Enterprise ng2 Margaret Thomson and Caroline Allison, an ng homes tenant. ng homes also won an award for its work on Activate last year from the Chartered Institute of Housing (Scotland) in the category ‘Excellence in developing skills and capacity’. The work of Activate has also been recognised further afield as part of an international collaboration with Kettering Foundation and Talloires Network in the United States participating with a number of other countries.This has resulted in a book that will be published this year: Regional Perspectives on Learning-by-Doing: Stories from Engaged Universities around the World.